Classic rock and hearty fare come together in The Rock. Should you make it through Alliance Town Center’s gauntlet of a parking lot to reach the northeastern corner, you’ll find a gigantic building with a logo beaming from the bottom of cartoon flames, the kind you see on the hoods and fenders of hot rods or shirts worn by hot-rod enthusiasts. 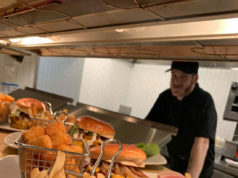 The “rock ’n’ roll roadhouse” theme extends inside The Rock Wood Fired Kitchen, where the likes of Led Zeppelin, Rolling Stones, and The Who blast from the sound system and where most of the menu items have cheeky classic rock-inspired names (Sharp Dressed Man, Hurts So Good Burger, White Room). The décor, while undoubtedly intended to look gritty, more closely resembles an urban loft that survived a bombing run, after which, instead of rebuilding, the inhabitants cleared the worst of the rubble and installed booths upholstered with printouts of the drive-time playlist of Lone Star 92.5, plus biker-friendly iconography like skulls and motorcycles. While rock ’n’ roll/Luftwaffe target is the restaurant’s visual gimmick, “wood-fired kitchen” is its culinary mantra. 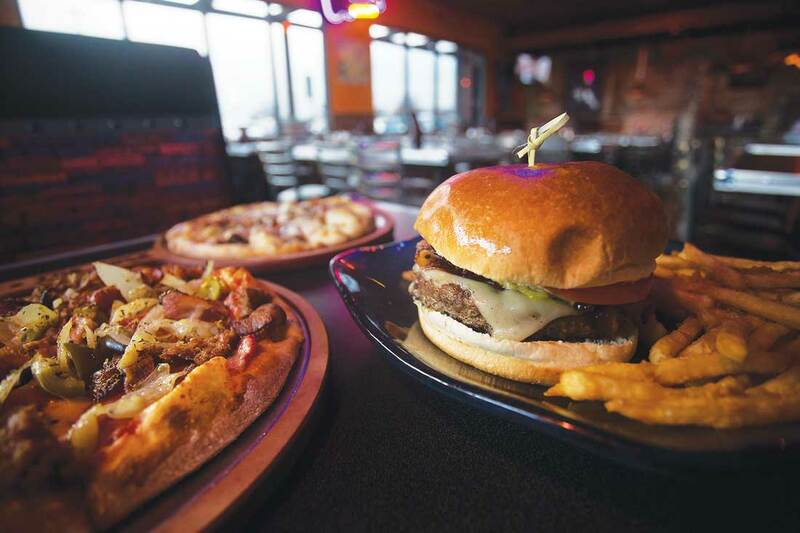 You would be correct in assuming that The Rock specializes in pizzas, but the kitchen offers just as many sandwiches, burgers, and specialty items. A lifelong fan of both Ozzy Osbourne and spicy things, I first sampled the Crazy Train, a signature pizza topped with tomato sauce, hot Italian sausage, peppered bacon, caramelized onions, oregano, and hot cherry peppers. The combo provided enough heat to make me break a sweat, but I wouldn’t say that it was unbearably spicy. The bacon was a crispy, zesty bonus to every bite lucky enough to include a piece. I also tried the My Generation, a pie covered in cream sauce, peppercorn ranch dressing, chicken, bacon, Swiss and mozzarella cheeses, and red onion. For all of its piquant, cheesy goodness, I had to stop myself from finishing even the personal, 9-inch size for fear of my arteries clogging more quickly than I-35 near Western Center Boulevard at rush hour. The pie probably deserves to be named after a far heavier song, though ordering a “Children of the Grave” would probably put a lot of people off. Both pizzas hit all the right notes, unlike the Smoke on the Water. 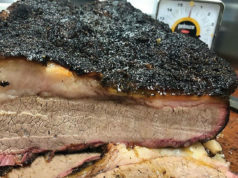 A cross between a French dip and Philly cheesesteak, the sandwich — made with a 7-ounce cut of flatiron steak and melted Monterey and cheddar cheeses — came cooked to order (medium-rare) with a side of jus so thick it could have been considered gravy. I had no complaints about the flavors. My beef, so to speak, was with the steak. After two fatty, extensively chewed bites, I gave up, flicked the gristly meat onto my plate, and attacked it with a knife and fork. The rustic French bread with the melted cheeses became a side of –– wait for it –– cheesy bread. Cheesy bread, incidentally, is one of the Rock’s starters. However, I sampled only the sweet potato fries and wings. Sometimes sweet potato fries are either too sweet or too soft, but the Rock’s cooks nailed the proper crispness and flavor, made even better by a side of Bayou Sauce (a tangy rémoulade). The wings were about as good as any other chain’s: nice and big and served in a sizzling cast-iron skillet. I’d ordered them as an appetizer, but they came out with my entrée, which brings up another issue: The service on my first of multiple visits was curt and rushed, which would’ve been semi-tolerable (it was a slammed weekday lunch, after all) if the food had come out in the right order. On subsequent visits, however, the service was more conversational and less hurried. In fact, when I ate at the bar during my last trip, the young woman bartending went above and beyond, particularly when it became obvious that my Hello Goodbye Burger required a fatter stack of napkins. Ah, the Hello Goodbye Burger, a half-pound patty slathered in a gooey mess: guacamole; a mayo with red peppers, artichokes, and olives; a thick slab of bacon; jack cheese; and tomato, all on a toasted bun. The Hello Goodbye’s multifarious flavor profile was well balanced, and the whole thing was fun to eat, thanks partly to the bun, which graciously stood up to the onslaught of goopy goodness. 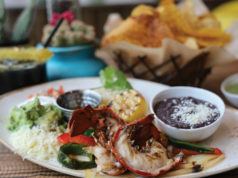 If you like House of Blues, Hard Rock Café, or any other big-box franchise with high-end aspirations, The Rock Wood Fired Kitchen has plenty to offer, which also means some dishes are unreasonably pricey. Still, the Crazy Train is a winner, and when you add a menu of creative liquoriffic “rocktails,” gluten-free options, and some tasty-sounding choices for vegetarians (especially pasta lovers), The Rock’s tunes might be worth adding to your regular rotation. 3351 Texas Sage Tr, FW. 817-741-7625. 11:30am-midnight daily. MasterCard, Visa only.